The 42nd seal of the Roboplastic Apocalypse is smooshed like a cartoon baby unicorn under the foot of a 2,000 foot tall iron golem in part two of my interview with American storyboard artist Wendell Washer! Yes it's more dungeoney and/or dragonny than an enchanted amusement park ride to 1985 as Mr. Washer takes us on a whirlwind tour of his career in the animation industry from the early 70s to the late 80s. What's the difference between a storyboard artist and a storyboard director? Is it possible to draw too good for Filmation? What's the right way to say Toei anyways? Find out all that and more in this PIE ON THE FLOOR FUNNY episode of the podcastalypse! Finding gold in a gremlin tree plus good tips on forgetting where it was. Spock looked so different without his ears! It's a new job, true believers! Okay so the big news (to me) today is that Google has a massive archive of Billboard magazine going back for decades. I've been looking through it and it's an absolute treasure trove of information. The most exciting development is that I've found Billboard sales charts for VHS releases during the mid 80s boom of licensed character cartoons. Around late '85 they went from just bunching all VHS sales together on their charts to doing a separate chart for children's video titles. This means the popularity of the VHS releases of many kids' cartoons from the Toy Robots Wars of the 1980s can be tracked, which is something I've always wanted to do ever since I did a series of blog posts tracing the Nielsen ratings of kids' shows in Variety magazine. 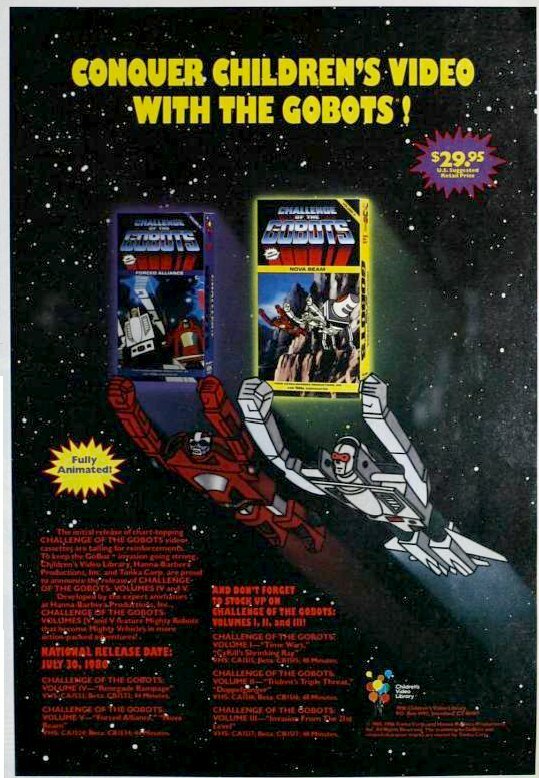 I also found a handful of cool robot related ads announcing the release of a couple of now classic VHS tapes featuring some of my favorite shows. Check them out! This Voltron ad is from the March 9, 1985 issue. Voltron, the videocassette. Wanted-By millions of kids. 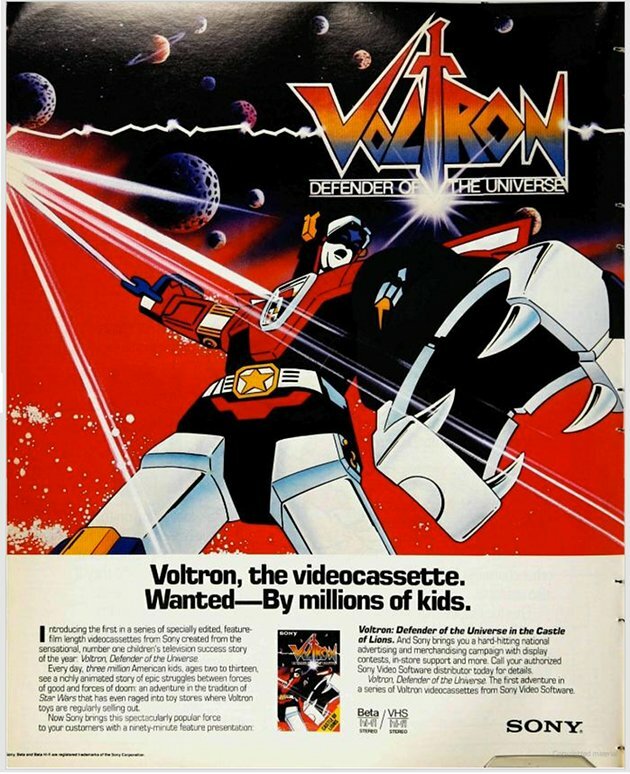 Introducing the first in a series of specially edited, feature film length videocassettes from Sony created from the sensational, number one children's television success story of the year: Voltron, Defender of the Universe. Every day, three million American kids, ages two to thirteen, see a richly animated story of epic struggles between the forces of good and forces of doom; an adventure in the tradition of Star Wars that has even rages into toy stores where Voltron toys are regularly selling out. Now Sony brings this spectacularly popular force to your customers with a ninety-minute feature presentation: Voltron: Defender of the Universe in the Castle of Lions. And Sony brings you a hard-hitting national advertising and merchandising campaign with display contests, in-store support and more. Call your authorized Sony Video Software distributor today for details. Voltron, Defender of the Universe. The first adventure in a series of Voltron videocassettes from Sony Video Software. It's interesting to me that this ad points out the Voltron audience extended to kids all the way up to thirteen years old, and that 3 million of them tuned in to the show every day. The first two Transformers VHS releases were hyped in this ad from Billboard's May 25, 1985 issue. Available for the first time two fully animated adventures featuring the phenomenal TRANSFORMERS. Both videocassettes at your local retailer now! $24.95 suggested list price. This ad is really cool because I think it's only the second F.H.E. promo I've ever found outside of comic books. (The other one was a Sunday newspaper comic strip advertising supplement that ran October 20, 1985.) 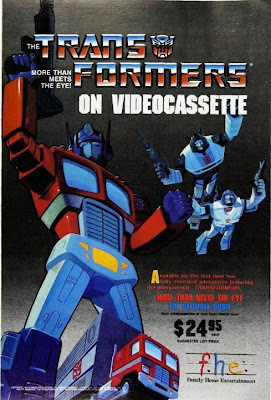 What is a bit perplexing to me is that the Billboard ad was published in the May 25th issue but other sources I've read say the Transformer videocassettes didn't hit retail until June of 1985. It could be that since the issue was expected to run in late May it wasn't too big of a deal that it jumped the gun on the release date. Heck, the videos may have been in the stores already by late May. For whatever reason the Transformers VHS tapes didn't start showing up in the Billboard charts until August 24 so I'm not certain of their exact release date. Here's more Voltron promotion, this time from the July 20, 1985 issue. His popularity is accelerating as quickly as a Mega Thruster. Everyday, three million plus kids, ages two to thirteen, rush home to watch the mighty Voltron Force that sweeps America everyday! Voltron, Defender of the Universe. Phenomenal toy sales. Number one children's TV show and videocassette. You've already seen the extraordinary action of the first Voltron release! Now Sony presents the second in a series of specially edited, ninety-minute Voltron videocassette features: Planet Doom. A richly animated story of epic struggles between forces of good and forces of evil. A video galaxy alliance for every VCR home. And Sony supports you with a national advertising and merchandising campaign which includes display contests and in-store promotions. Call your authorized Sony Video Software distributor for details. Voltron to dealers: Next stop, the stars. One thing that really impresses me about Voltron is how much press he got in trade magazines. There's the two full color, full page ads in Billboard shown here and also a ton of ads in the entertainment industry trade publication Variety. All of them mention how strong the cartoon was but this one goes a little overboard with the hyperbole. (Who were all these two year olds that were running home to watch Voltron?) A galaxy alliance for every VCR home? 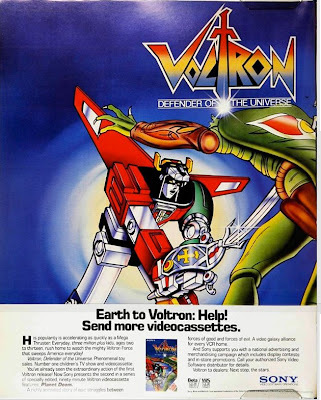 I think that's Voltron's way of letting you know the likelihood of your family being eaten by Robeasts was inversely proportional to the number of Voltron VHS tapes you owned. Unfortunately I can't make out much of the text of this ad from the June 21, 1986 issue. But I can tell it's advertising the first five volumes of Challenge of the GoBots. I'll get to work on deciphering it later. I'm pretty excited about all this and am right now planning a future podcastalypse about these old VHS tapes and how well they sold relative to each other. But if you don't want to wait for my analysis, go check the lists out at Google's Billboard archive right away! Veteran storyboard artist and special guest Wendell Washer cracks the 41st seal of the Roboplastic Apocalypse! Yes it's the first part of a two episode interview with a man who had a hand in creating many of the most memorable shows and scenes from the animated shows I grew up watching! From Filmation to Hanna Barbera to Marvel and beyond, Mr. Washer worked as a storyboard artist at many of the great American animation studios of the 70s, 80s and 90s. He shares in this episode the early beginnings of his career and what it was like to grow up a fan of cartoons while pursuing an education that had him headed entirely in another direction. How did a science major aspiring to be a nuclear physicist from Chicago end up working in animation in Hollywood? What Donald Duck short was the first cartoon that inspired him? Who would win in a fight between Gigantor and Optimus Prime? Find out all that and more in this I'M 99% HYSTERICAL edition of the podcastalypse! 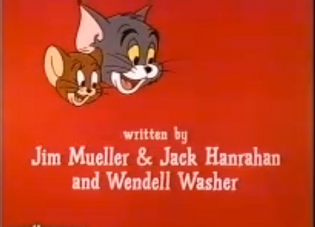 How did they ever make cartoons before computers? Am I taking Chemistry or German?